The Graduation Ceremony commemorates the precious moments of the young children, and offers an opportunity to celebrate the past achievements and the beginning of new experiences to come. 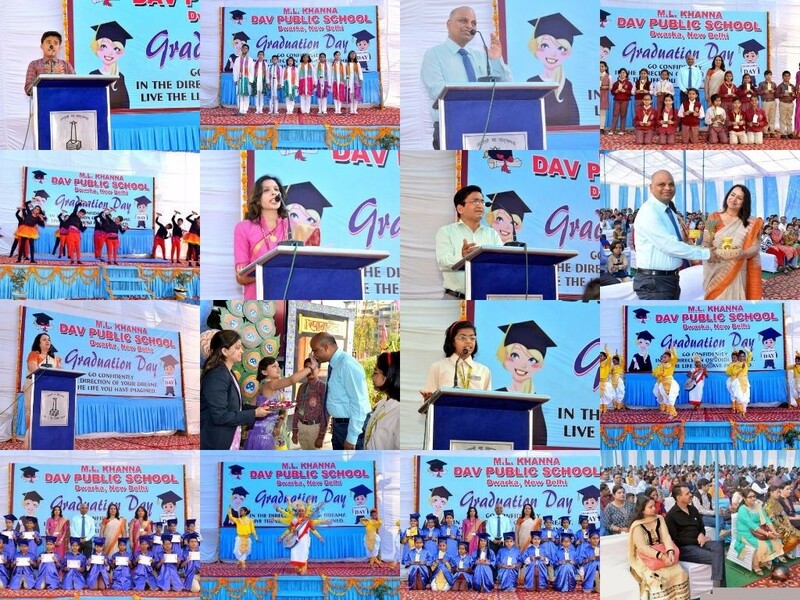 On Thursday, 14th March, 2019, the school atmosphere was filled with euphoria, illuminated with shining faces of excited students as the school celebrated its Graduation Day for class IV students. The event was graced by the Chief Guest Colonel H.V. Sharma, National Secretary, Veterans India and the Guest of Honour Mrs. Sudha Sinha, Editor, Dwarka City newspaper. 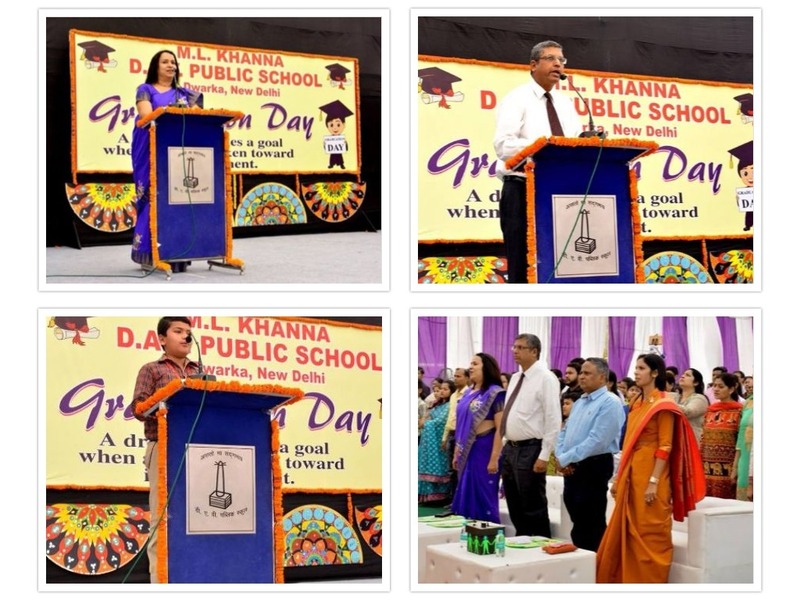 The celebration commenced with the ‘sow and grow’ welcome of the Chief Guest by school Principal Ms. Monika Mehan. It was followed by lamp lighting and DAV Anthem. To mark the special day, the school choir presented a melodious welcome song. The Junior Head Boy, Yashraj Chabbra and the Junior Vice Head Girl, Suhani Suri, presented their thoughts on their vision for the future. The parent representatives also expressed their gratitude towards the school and the teachers for helping the students unleash their true potential. The performers of Bizhu dance, put up a great show of confidence and charisma. Their energy and vibrancy enthralled all the spectators. An exhilarating musical performance was presented by adorable young learners. The students presented an endearing western dance performance, the energy and exuberance of the children was a joy to behold and finally, the students were felicitated by the dignitaries. Super achievers of class IV were felicitated by the guests. Principal Ms. Monika Mehan congratulated and blessed all the Dwarkadheers and graduates of class IV in her motivating address. The Supervisory Head of classes III and IV delivered vote of thanks expressing heartfelt gratitude to the Chief Guests and the parents. Indeed it was a memorable event for the parents and the young graduates. 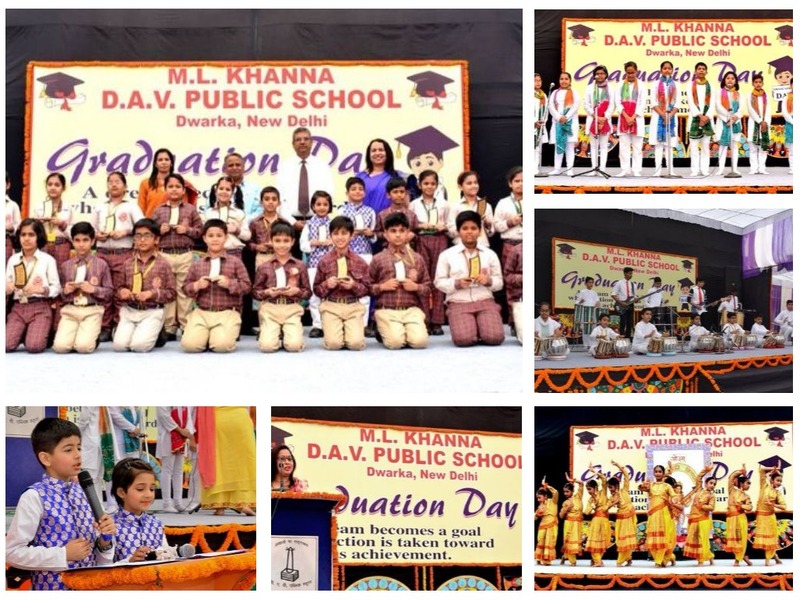 M.L.Khanna DAV Public School, Dwarka bubbled with excitement and enthusiasm when Graduation Day was celebrated for the students of class IV. The function was graced by the chief guests Dr. B.C Sabata, Senior Scientific Officer, Govt. of NCT of Delhi and Dr. Neeraj Sharma, a distinguished educationist. The function commenced with the lighting of the lamp followed by the welcome song. Principal Ms. Monika Mehan, in her address, complimented the graduates on their achievements. She also congratulated the teachers for their dedication and hard work in shaping the future of the students. Dr. B.C. Sabata motivated everyone to improve and protect the quality of the natural environment by bringing about changes in environmentally harmful human activities. Dr. Neeraj Sharma inspired everyone to pilot new ideas and possibilities, learn to work with a winning attitude and face the challenges of life boldly. The students of classes III and IV presented mesmerising musical and dance performances. On this occasion, parents also shared their experiences and expressed their gratitude towards the school .The Junior Head boy and Junior Head Girl also conveyed their indebtedness to the school and the teachers for guiding and motivating them to scale greater heights. This was followed by the distribution of graduation certificates. It was a proud moment for everyone when the young graduates of class IV were felicitated and congratulated for their outstanding performances. The Junior School Council members were applauded for their tireless efforts. They were presented the book 'The Fall of Dacca' written by General G.D. Bakshi, a member of Veterans India. The ceremony concluded with the vote of thanks by the supervisory head of class IV followed by the National Anthem. The graduation ceremony was held to felicitate the students of Class IV on their successful completion of primary level schooling and stepping into middle school. The chief guest on the occasion was Professor. Ashish Mohan, Head of the Department of Chemistry, SUPER 30 Institute, Patna. The ceremony began with a welcome song, followed by cultural programmes presented by the students of classes III to VI. Principal Monika Mehan, in her address, mentioned the role of parents in shaping the student’s attitude towards school and studies. She urged the parents to display good habits to set an example for their wards who look up to them as their role models. The Chief Guest, Professor Ashish Mohan mentioned that education should not be confined to classroom learning but also include the development of various skills to nurture them into confident learners. Students of classes III and IV who attained a CGPA OF 10 by scoring A1 grade in all subjects during the session were conferred upon with the title ‘DWARKADHEERS’ for their relentless hardwork and dedication.Students with 100% attendance in the session 2016-17 were also felicitated with trophies. The students of class IV were awarded with the Certificate of Graduation. The programme culminated with the vote of thanks which was presented by the supervisory head of classes III and IV. 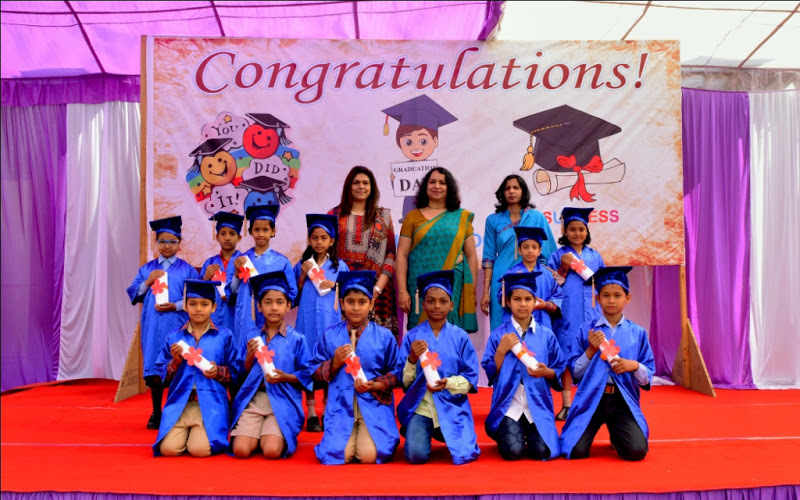 A Graduation Ceremony was held to felicitate the students of Class IV on their successful completion of primary level schooling and stepping into middle school .The occasion was graced by Ms. Nonica Kochhar, Technical Expert, Face to Faith, Tony Blair Foundation. The ceremony commenced with the ceremonial lamp lighting by the Chief Guest, the Principal and the parents.A melodious welcome song was presented by the school choir. ‘Shiv Stuti’, a mesmerizing performance by the learners of classes III to VI earned a huge applause. The highlight of the programme ‘Laughter Dance’ by the students of classes III and IV stole everyone’s heart and made them laugh. An enchanting Rajasthani folk dance was also performed by the little angels. The Junior Head Boy and Junior Head Girl delivered speeches conveying their heartfelt gratitude and regard for the school and the teachers. Parents of some students also expressed their appreciation for the school through their gratifying words. The dazzling part of the ceremony was the formal felicitation of the scholars of class IV. The Principal and the Chief Guest awarded Graduation Certificates to the students and laudedtheir sterling achievements. Principal Ms. Monika Mehan applauded the hard work and relentless efforts of Dwarka Dheers and wished them success for their bright future. The Chief Guest, Ms. Nonica Kochhar congratulated the young graduates and inspired them to use technology as a ladder to scale the heights of success and become digitally empowered 21st Century learners. The eventfulday culminated with the vote of thanks by the Supervisory Head of classes III and IV. 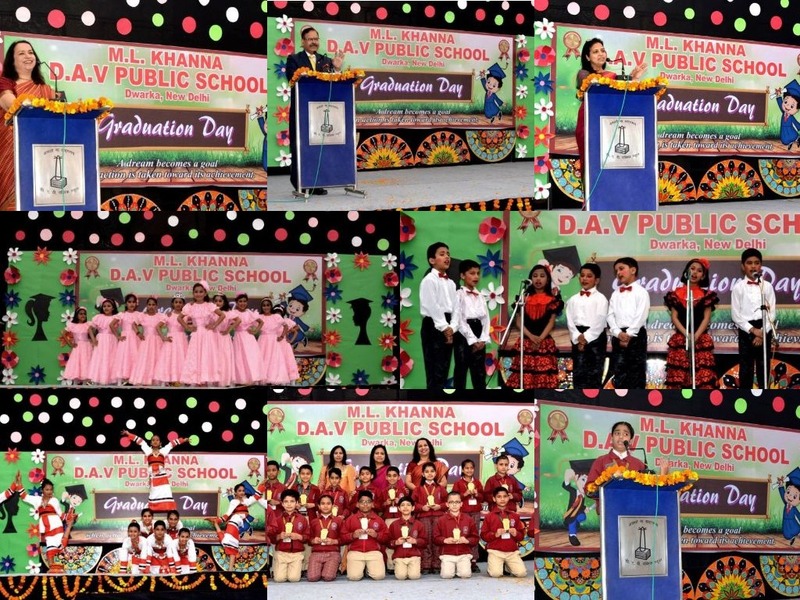 The school celebrated the GRADUATION CEREMONY for the students of class IV on 26 March 2015. The ceremony was organized to appreciate and applaud the young learners for their remarkable performance in the session 2014-15 and to formally promote them to the next grade. The occasion was graced by Mr. S R Arora (Secretary, DAV CMC ) and Mrs. Arora, an eminent educationist, who were the chief guests. Parents of all the students were also invited to be a part of this ceremony. All the guests witnessed and thoroughly enjoyed a wide range of amazing performances put up by the students. The ceremony commenced with a mesmerizing Saraswati Vandana followed by a scintillating classical fusion dance performance by the students. The spectators were spell bound by the grooving salsa dance presented by the cute little angels of class III. The Junior Head Boy and Junior Head Girl also expressed their gratitude for the school and their teachers through their heart-touching speeches. This was followed by speech of some parents’ representatives who also expressed their appreciation and gratitude towards the school. The ceremony culminated with the formal felicitation of the students of class IV. The school principal Ms. Monika Mehan and the chief guests presented the students - graduation certificates and appreciated them for their amazing accomplishments.